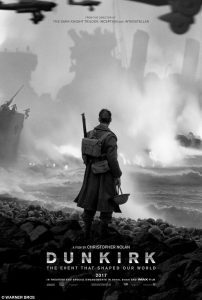 Christopher Nolan’s most recent feature film, Dunkirk, depicts a story of the sacrifice, survival, and heroism experienced through the events that occurred at the Battle of Dunkirk during World War II. Nolan illustrates three different story arcs – The Mole, The Sea, and The Air – each illustrating a different theme of the story. At the climax of the movie, the arcs conjoin, and then split off once again, concluding in their own way and ending at different times. With the assistance of the musical genius Hans Zimmer, Christopher Nolan creates an electrifying atmosphere, keeping the audience on the edge of their seats throughout the entire film. Opening up with big, bold, white letters spelling “The Mole,” Nolan kicks off things with a group of soldiers in an abandoned French town of Dunkirk. As they get picked off one by one from a German ambush, only Tommy, one of the soldiers in the group, is able to escape to the beaches. On the beaches, Tommy encounters Gibson, who is burying a fallen soldier. Together, along with Alex, another soldier who is saved by Tommy, they attempt to cross the English Channel. However, they fail many times, ending up on the beaches again and again. With each attempt, they struggle to survive and face challenges. Christopher Nolan attempts to portray to the audience the thoughts and emotions of a soldier attempting to escape to safety, using these multiple trials to demonstrate the extent of the battle in the eyes of one trying to escape. The Mole demonstrates the theme of survival, as these soldiers keep on fighting to escape the beaches, and escape the threat of death. Christopher Nolan then introduces the next arc, with the words “The Sea” appearing on the screen. This next arc begins with Mr. Dawson, Peter, and George sailing out to rescue the soldiers of Dunkirk. “The Sea” is based off the true story of “The Little Ships of Dunkirk,” where around 800 privately owned ships assisted in the rescue of the troops at Dunkirk. Along their journey to reach the troops at Dunkirk, they come across a shell-shocked pilot known as Collins, and attempt to navigate past the German bombers and U-Boats. The Sea demonstrates themes of heroism, such as George’s attempt to become noteworthy and end up in his local paper. Finally, Nolan portrays the last arc, which is “The Air.” In this arc, Christopher Nolan demonstrates the air battles that were taking place throughout the duration of the battle. We are introduced to Collins and Farrier, two pilots in the same squadron. They encounter enemy planes, and Collins has to return to base due to damages to his plane. This leaves Farrier alone with a broken fuel gauge. Farrier continues onwards, attempting to clear as many bombers to keep those on the ground and sea safer. The Air demonstrates themes of sacrifice, as Farrier risks his own safety in the attempt to save other soldiers. Dunkirk is rare type of war movie. Not only does it demonstrate different perspectives of the battle, but it also showcases the stories of unsung heroes with themes that demonstrate their bravery. Due to the tension and stress that doesn’t let go of its grasp on the audience until the very end, there is never a moment of boredom while watching it. Dunkirk is truly a different beast from previous war films, and among the best out there.